Black Friday is out and Plaid Friday is in! The merchants of historic Sutter Creek invite you to spend Friday, November 23, 2018 with them. Toss on a plaid scarf, wear a plaid shirt, hat, or whatever you have that is plaid and you will receive discounts throughout town and have fun participating in this new and wonderful tradition. Stroll beautiful Main Street and spend a relaxing day shopping in Sutter Creek’s wonderful boutiques with some of the most unique and one of-a-kind gifts for your Christmas list. Each store is a small business, with hand-picked items that you won’t find in the malls. You will be welcomed and given personalized customer service. You can also treat yourself to some of Amador County’s finest wines in Sutter Creek’s many Wine Tasting Rooms and bring home some wine for gifts too! Make a weekend trip of it and stay at one Sutter Creek’s fine B&B’s or handsome hotels and experience another relaxing day in Sutter Creek. Make it your new Holiday traditions that you will enjoy and your family will remember for years to come. Downfalls to Plaid Friday in Sutter Creek. You will miss out on waking up at 2 in the morning to travel in the cold and dark to go to the mall. You will not be part of a frenzied crowd, pushing and shoving to get to a deal that disappears just before you get to it. You won’t wait in long lines to find an overworked and tired sales clerk that would rather be home in bed (or working in Sutter Creek). Instead you will find friendly customer service, unusual items and experience how Christmas shopping should be fun. 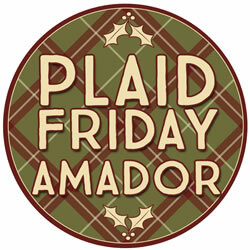 Visit Sutter Creek for Plaid Friday, this November 29th.